Omkar More scored for the Beachside club in the first half, while Veegan Ferrao scored from the spot in the second half to cancel it. FC Goa scored in the added time as they hold Calangute Association to a 1-1 draw in the Goa Professional League match played at Duler Stadium earlier today. Calangute had drawn their last match against Vasco SC, while Goans were in fantastic form after defeating FC Bardez 4-1 in their previous match. 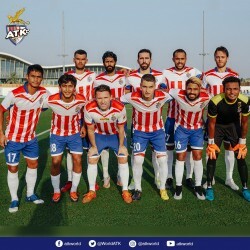 Goan coach Clifford Miranda started without their star striker Liston Colaco and Leander D’Cunha bringing in Hayden Fernandes and Enestar Malngiang in the lineup, while despite consistent performance in the last two matches, Amar Halankar was left out of the Calangute starting XI, whereas Sanjay Vengurlekar and Rohan Pednekar joined the defender on the bench. Aniket Mandrekar, Leslee Britto and Marc D’Cruz were the new faces in the beachside squad. The match started with an offensive football from the Goan side as they had the early chance to take the lead in the 2nd minutes when Saviour Gama made a long cross to Aaren D’Silva in the box but the frontman failed to connect from close. Whereas Calangute also had a chance in the 27th minutes when Substitute Omkar More who replaced injured Aniket sent a short pass to Josley Dias outside the box but the striker shot sky high from the edge of the box. In the 40th minutes, Goans were lucky not to concede as Goan defender Lalnunsiama clearly handled Calangute’s Bonny Niasso cross in the box but referee Jose Dias who was watching it closely ignored the same. However, Calangute did not take long to open their account as with just three minutes past More made a dangerous run cutting past few defenders and drilled a powerful shot from the top the box which found the net making it 1-0 for the Beachside at halftime. On crossing over, Calangute’s just-in Myron Fernandes combined well with Leslee before releasing a perfect through ball to More but Goan keeper Iprotip Das advanced to clear the danger. In the 70th minutes, Jason Barbosa was the culprit for not putting the Goans on the level as he headed wide from point-blank range off Aaren’s cross from the box. At the other end, More had another chance to double their lead when he made an individual effort from the halfway line but saw his powerful shot brushed off keeper Das’ hands for a corner. A few minutes later, Goan’s midfielder Kingslee Fernandes was lucky to escape without a card as he purposefully pushed Mayur Shelar in the play, but like the last time referee, Jose ignored the situation. Goan found the equaliser in the added time when Bersal Viegas unintentionally handled the ball just inside the box but this time referee Jose was quick enough to point towards the penalty spot. 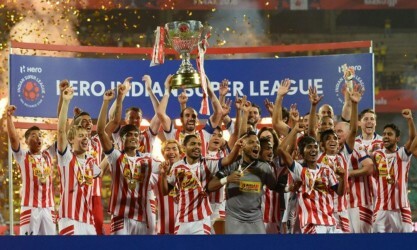 Later, Substitute Veegan Ferrao made no mistake from the spot to put his side on the level and rescue a point from the match.